Buying a used bike can seem like an overwhelming experience to a first time buyer. What do I look for? What do I need to ask? How do I know I’m not buying a lemon? 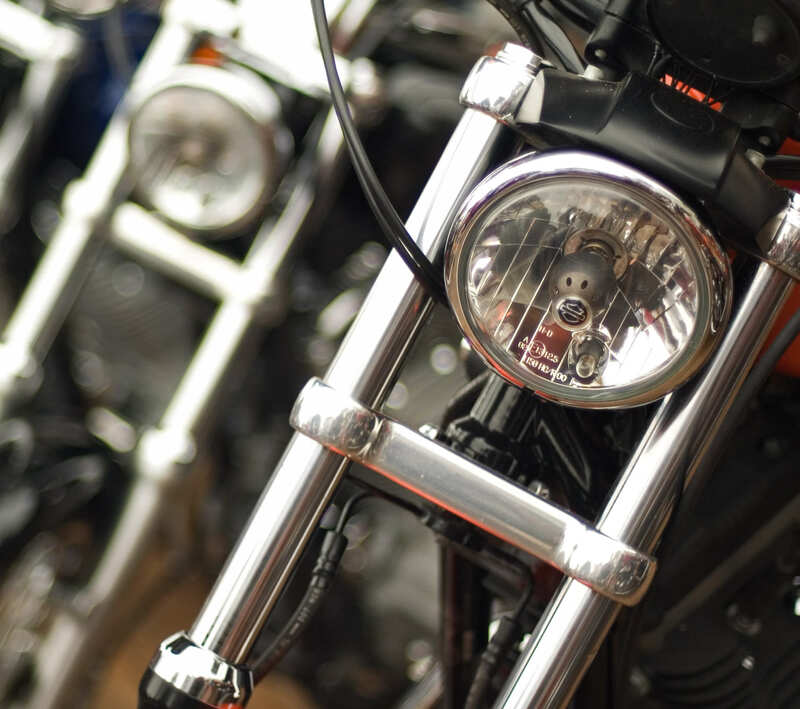 At Motorcycle Shippers we deal with buyers and sellers everyday, and background in the motorcycle industry makes us more knowledgeable than most when it comes to choosing a good deal on a used bike. The following will touch on some of the basic things a new rider (and even experienced riders) should look for when buying a used motorcycle. Let’s start cold. You’re walking up to the bike for the first time. What is your first reaction? Man, look at that bike shine! Unless you’re looking for a project/restoration bike, this is exactly what you want to see. Pride of ownership in is reflected in the appearance. Most riders take extremely good care of their bike’s exterior. You want to look good right? Let’s look a little closer. Look the bike over carefully. It’s easy to tell the difference between a bike that’s just been “quick cleaned” for a sale and the one that’s been garage kept and pampered by a true enthusiast. Check all the tight spots. You know the hard to reach places where dirt can accumulate. The enthusiast will take the time to get into these areas and keep his bike looking showroom. The “quick cleaner” will not. He’s hoping that your excitement will over ride your common sense and you won’t be looking too closely. A clean bike is usually a happy bike. We won’t address how much importance to place on the cosmetics of the bike. You may be interested in an older “project” bike and will be willing to overlook some flaws in the finish. You may be looking at a “brush popper” and a slightly rough look is to be expected. Only you know what is cosmetically acceptable. Let’s check out the exhaust first. I know you want to start the bike up and hear it roar. There’s plenty of time for that later. You want the bike cold for the initial inspection. In fact, when you call the seller to ask him where to come see the bike, make sure to tell him not to run it before you get there. Here’s why. First, you want to touch the exhaust. You’re feeling for rough spots that indicate rust, dents or corrosion. Places on the exhaust that you may not have a clear view of you may feel areas of corrosion that has actually rotted through. You would probably hear the blow by when you start the bike but now you know the listen for it. Another reason to have the bike cold when you arrive is so that you can cold start it. Warm engines turn over easier. As long as you’re down there checking on the exhaust, you might as well give the frame the once-over. Look closely. You’re looking for dents, scrapes, cracks. Is there any indication the bike has bottomed out, taken a hard landing or been in some kind of accident? Get hands on with the frame too. Slide your hands over as much of the frame as you can. You may feel something you can’t see. A little slack in the clutch cable is normal and any excess can usually be adjusted out. Squeeze the clutch in. Is it smooth? Release the clutch slowly. It should release smoothly. You should not feel any “snags” or “pops” as the clutch lever is engaged or released. Have a seat on the bike. Engage the clutch. The bike should roll smoothly with little resistance while in first gear with the clutch engaged. While sitting on the bike, take it out of gear and roll it forward. Gently apply the front brakes. The brake lever should operate smoothly and the bike should slow to a stop with little to no noise from the brakes. Release the brake lever. It should return smoothly into position and the bike should now roll freely with no dragging of the brake calipers. If they drag, they need work. While straddling the bike, shove down on the front end. The forks should return to position immediately and almost silently. Any loud noise can be bad news. Look at the fork seals. They should be clean and smooth. There should be no fork oil on the tops of the seals or on the forks. If there is a bit of oil around the fork seals the bike may just need new seals which are relatively affordable. But if there are nicks or rust on the fork tubes a more serious repair is needed. The forks themselves should be clean, shiny and smooth. Bounce up and down on the seat. The rear shock(s) should offer some resistance and return the rear end to normal position without springing up and down. Check the tension of the drive chain by pulling it away from the rear sprocket at the three o’clock position. (Nine o’clock if you’re left handed) you should not be able to pull it farther than about half way off the sprocket tooth. Any farther and it’s time to replace. The inner area of the chain that contacts the sprocket should be clean, smooth and shiny. Smooth even wear should be expected and is no cause to worry. Severe wear on the center third of the rear tire could be an indicator of long distance freeway riding or performing “burn outs”. The latter is definitely not good for the tire but also causes unnecessary abuse on the engine. Excessive hard braking and skidding can cause flat spots on the tire. One sided scuff marks on the front tire could be due to the wheel being offset. It’s trying to pull to one side and you’re pulling back to the other side causing more wear to one side of the tire than the other. Diagonal scuff marks indicate an alignment problem. Open the fuel cap and look inside. You may want to bring a flashlight with you. You should be looking through a light amber colored fuel and clearly see the bare metal interior of the fuel tank. If the fuel is dark it’s probably old and should be drained and replaced. You’ll also want to clean the fuel system just to be safe. When inspecting the fuel tank you want to look for rust or any grit or sediment in the tank. If you’re not sure if you’re seeing sediment, rock the bike gently from side to side and set up a small “wave motion”. If there’s sediment you’ll see it shift from side to side. If the tank is full be careful not to overdo. You want to keep the fuel in the tank. Some fuel tanks may have a coating applied to them to prevent or even cover old rust. In this case you will not see a shiny silver surface but more likely a light milky surface. The normal appearance of coolant is neon green and should smell sweet. With the engine cold, remove the coolant cap and take a look. Green is great. Brown colored coolant could mean either rust or oil has invaded the engine. If the engine has begun to rust, you will want to consider some costly repairs in the future. If you have oil in your coolant you may have a leaking head gasket or failed O-rings. O-ring repair is not a death warrant for a bike but fixing a head gasket is a job for an expert “gear head”, so you may want to re-consider your purchase if this condition exists. If the bike has a sight glass on the side of the engine you can see immediately the color of the oil. If the sight glass is discolored or brownish, the oil may have begun to “varnish” the engine interior. This is caused by not keeping up on frequent oil changes. If there is no sight glass, use a stick, cloth, paper towel or other such item and dip it into the oil via the filler cap. Clean syrupy looking appearance is new oil. It’s been changed recently. If the oil is black, you’ll want to ask when the oil was changed last. So, new oil and black oil is normal. What isn’t normal? Water and oil don’t mix. If the oil has white milky streaks in it, water is getting into the engine. You may not want to purchase a bike with this problem unless you’re ready to tear down the engine. Oil impedes wear on an engine but does not fully prevent it. Normally, unless the oil has been recently changed you may feel a very slight grit when you rub a drop between your thumb and fore finger. If you feel or see shiny metal flakes in the oil this is very bad news. This engine is eating itself from the inside out. You do NOT want this bike. Alright, you’ve looked the bike over carefully and you’re ready to hear it run. Each bike has its own cold start temperament and you will eventually get to know yours. Make sure the fuel petcock is turned to the “on” or “reserve” position. Depending on the bike you may have an electronic choke that requires no manipulation or you may have a manual cable type choke. If it’s manual, ask the seller to set it at his preferred setting. He’ll be happy to set it for you. He wants it to want it to start right up for you. Ask him how much throttle he normally gives the bike on startup. If it has an electric starter, use it. You want to make sure it works and there will be plenty of time to look cool kick starting it later on. Once the engine is running, return the throttle to its normal position. You don’t want to “redline” a cold engine. While the bike is warming up, take the time to notice. Is it running smoothly? Is the engine chugging? (Maybe not enough choke). Look behind you. Is the bike smoking? If your bike is running a fuel/oil mix, (dirt bike) a little smoke is not unusual. If it’s smoking a lot, it could be a fuel/oil ratio mis-match or a timing issue. A street bike should not be smoking. Depending on the color of the smoke, a smoking street bike could mean trouble. Dark smoke and a heavy fuel smell is probably just a fuel/air ration problem and can be adjusted away. Blue smoke is burning oil. You should probably walk away from this bike. White smoke or steam can be coolant in the exhaust which is most likely due to a leaking head gasket (major repair needed). Listen to the engine. Do you hear any knocking, rattling, pinging etc.? It should be smooth and clean sounding. If you happen to own a mechanic’s engine stethoscope then by all means, bring it with you. It’s like what a doctor would use but has a long metal probe on the end rather than that icy cold cup we’ve all gotten to know and love. Most people don’t own one of these but an old friend taught me a simple trick for listening deep into an engine. Bring a wooden dowel rod with you when come to look at the bike. This is also handy for checking the oil as mentioned earlier in this writing. Touch one end to the engine and place your ear against the other. Internal sounds will be transmitted through the rod and you’ll be able to hear it from the other end. Place the rod in several locations on the engine and listen carefully. A couple of words of caution. Make sure the rod is long enough so that you don’t lean into a hot engine. Also, if you used the rod to check the oil’s condition earlier, don’t stick the nasty end in your ear! Assuming no unusual noises were heard and the engine seems to be running normally, begin a check of the vehicle’s lighting system. Check the headlight. Make sure the high beam is working. Check the break light and turn signals. Make sure all the hazard lights are functioning. Check all the gauges. Most sellers will not let you test drive the bike but it doesn’t hurt to ask. Ask for all the service records and receipts for the bike. The thoughtful rider will save all service records. Perhaps the seller is the “do it yourself “type. This is not necessarily a bad thing. One of the best used cars I ever bought was off a racing car mechanic. The thoughtful “do it your selfer” should have receipts and records of all repairs. We also recommend that you get an official Motorcycle History Report from Cyclechex. It’s inexpensive “peace of mind” when buying. Finally, carefully check the bike’s VIN number and license plate number against the title and make sure they match what’s on the title. The last thing you want is to buy a bike you can’t register. If the bike doesn’t have a current registration or sticker or if it’s registered in another state you should contact the appropriate State Department to determine what the fees might be to register and bring it current. Also make sure there isn’t a lien holder on the title, and if there is they should have signed off their portion. Of course if the seller doesn’t have the title you should pass on the purchase. Finally, once you’ve made your purchase, have your bike inspected by a qualified motorcycle mechanic. This vehicles safety should always be your primary concern.